Think of the market as a set of magnets, pulling people into dense clusters. 80 percent of the population of the US lives in a large city’s metropolitan area, and the top 10 metropolitan areas alone account for a quarter of the population. Cities like Chicago and New York pull people not only from all over the country, but from all over the world. As new people are born and raised in each metropolitan area, the market sorts out where their skills would best be put to use. If it’s somewhere other than where they are, the magnet is engaged to pull them to the new destination. People are not only pulled towards locations, but towards careers and towards investing in particular skillsets. The actual mechanism in the place of the figurative magnets is not always as straightforward as offering more money to live in one place than another, or to take one career track over another, but it often is. There are other things, too, such as what professional development courses and training your current employer is willing to pay for you to take. Taking as my inspiration the John Adams quote at the top of this post, I’m going to argue that the mechanisms the market uses to pull people into particular locations and career paths grow weaker as a population grows wealthier. Where Have All the STEM Majors Gone? Consider computer technology. In 2009 the U.S. graduated 37,994 students with bachelor’s degrees in computer and information science. This is not bad, but we graduated more students with computer science degrees 25 years ago! The story is the same in other technology fields such as chemical engineering, math and statistics. Few fields have changed as much in recent years as microbiology, but in 2009 we graduated just 2,480 students with bachelor’s degrees in microbiology — about the same number as 25 years ago. Who will solve the problem of antibiotic resistance? Anyone can see that the average computer science major is going to make more money than the average visual arts major. The market has engaged the magnets and students aren’t budging. The likelihood of 20-somethings moving to another state has dropped well over 40 percent since the 1980s, according to calculations based on Census Bureau data. The stuck-at-home mentality hits college-educated Americans as well as those without high school degrees. According to the Pew Research Center, the proportion of young adults living at home nearly doubled between 1980 and 2008, before the Great Recession hit. Let’s compare two hypothetical individuals, Tom and Harry. Tom is a 20 year old living 50 years ago, and Harry is a 20 year old today. My general hypothesis is that there are lower stakes for Harry’s decisions than for Tom’s, and that anything which requires a great deal of time and effort requires Harry to give up more than Tom had to. Let’s consider Harry first. In the immediate term, he has an enormous amount of options for how to spend his time. There’s cable TV, the internet, video games; a whole myriad of stuff. Any field of study that takes up a lot of his time means giving up time doing any of that. As Tabarrok described, the average individual like Harry today chooses majors that not only demand less of his time–thus giving him more time to play video games–but are also enjoyable in themselves, such as the visual arts. After college, if he can’t get a job in anything resembling what he majored in, he can probably live with his parents, where he’ll still be able to enjoy many of the things he was already doing with his free time. Now consider Tom. Sure, he probably had access to TV, but it wasn’t as pervasive as it is today, and it had like three channels. There were no video games, there was no internet or web; there weren’t even personal computers. If he picked a major that was a dud in the marketplace, maybe he could live with his parents–though he was less likely on average than Harry to be able to, as parents today are much wealthier than parents were fifty years ago–but what would he do there? Fifty years ago you needed more money to be able to get anything approaching the level of options that Harry has available almost by default. Consider the different stakes: if Tom doesn’t get his career going, he becomes a burden on a family that might not be able to afford it, and he is also probably bored out of his mind and increasingly isolated. Harry, on the other hand, is much more likely to have parents who can afford that burden, and he has much more to do while he lives with them. He can entertain himself, and he can talk to people online; you may argue that the latter isn’t as fulfilling as in-person socializing, but it’s far less lonely than having no one to talk to. Now consider what each has to give up by pursuing a STEM career: Harry loses out on hours of gaming, movies, TV, browsing the web, talking to people on Twitter, and so on. Tom doesn’t have any of that to lose. 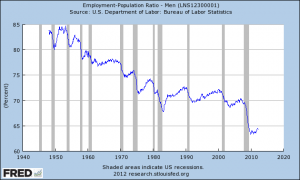 The decline in the portion of men who are employed has been a secular trend for decades. 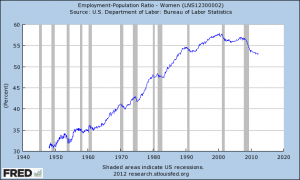 It has been hidden in the general population employment ratio because of the entering of women into the workforce. Note, however, that though the portion of women who are employed has grown, it still has never reached the level that men have fallen to now, during a soft labor market. The good news is that we are so wealthy as a society that fewer men need to work than they used to. The bad news is that our wealth is making it harder to convince people to do the difficult work required to make the kinds of material breakthroughs that people in the STEM fields are able to make. It has likewise grown harder to convince them to move away from their friends and family in order to go to the city where their particular skillset might have the greatest impact. John Adams was right–the mathematical, architectural, and commercial know-how of our ancestors has made it possible for more of us to study poetry and comparative literature. When people are bemoaning the lack of STEM majors and labor mobility, they should remember that the whole point of wealth is to provide us with more options. If someone is more satisfied spending their time reading and writing fiction rather than learning statistics or trigonometry, there is nothing wrong with that. They can increase our overall wealth just as much as a scientist can, if they produce things that are valued by a lot of other people. On the other hand, it takes STEM skillsets to cure cancer or build self-driving cars, and the per-capita amount of people with those skillsets continues to fall in this country. Still, I’m not too concerned. The vast majority of the world is nowhere near as wealthy as we are. Engineers, programmers, and chemists are being trained in unprecedented numbers in countries like China and India, and for the most part the whole world will benefit from their advances. As those countries grow wealthier, they’ll experience the same phenomena, but we’ll still be talking about enormous numbers of people with STEM skillsets. And we’re a long ways off from the developing world reaching a level of wealth comparable to the US or Western Europe.